A new MRI study from the University of Pittsburgh has found distinct injury patterns in the brains of people with concussion-related depression and anxiety. The team state that the data findings may lead the way to improved treatment and understanding of these common disorders, researchers said. The opensource study is published in the journal Radiology. Previous studies show that post-concussion psychiatric disorders like depression, anxiety and irritability can be extremely disabling for those among the 3.8 million people in the United States who suffer concussions every year. The mechanisms underlying these changes after concussion, also known as mild traumatic brain injury, are not sufficiently understood, and conventional MRI results in most of these patients are normal. The current study used diffusion tensor imaging (DTI), an MRI technique that measures the integrity of white matter, the brain’s signal-transmitting nerve fibers, to see if injuries to the nerves may be the root cause of these post-traumatic depression and anxiety symptoms. The researchers obtained DTI and neurocognitive testing results for 45 post-concussion patients, including 38 with irritability, 32 with depression and 18 with anxiety, and compared the results with those of 29 post-concussion patients who had no neuropsychiatric symptoms. The results showed unique white matter injury patterns in the patients who had depression or anxiety. Compared to controls, patients with depression had decreased fractional anisotropy, a measure of the structural integrity of white matter connections, around an area near the deep gray matter of the brain that is strongly associated with the brain’s reward circuit. The team state that the regions injured in concussion patients with depression were very similar to those of people with non-traumatic major depression disorder. They go on to add that this suggests there may be similar mechanisms to non-trauma and trauma-dependent depression that may help guide treatment. The data findings also showed that anxiety patients had diminished fractional anisotropy in a part of the brain called the vermis that helps modulate fear-related behaviours. Since the vermis has not been associated with dysfunction in non-traumatic anxiety disorders, this finding may indicate that different treatment targets are required for patients with anxiety after trauma, the researchers state. No regions of significantly decreased fractional anisotropy were seen in patients with irritability relative to the control subjects. The team state that there are two major implications for the study. First, it gives an insight into how abnormalities in the brain occur after trauma, and second, it shows that treatments for non-trauma patients with neuropsychoatric symptoms may be applicable to select concussion patients. They go on to add that the study also raises the possibility that some people diagnosed with non-traumatic depression may actually have experienced a subclinical traumatic event at some point earlier in their lives that may have contributed to the development of depression. In the future, the researchers hope to compare DTI findings in concussion patients with depression to those of people who have non-trauma-related depressive disorders. Axial & Sagittal Images. 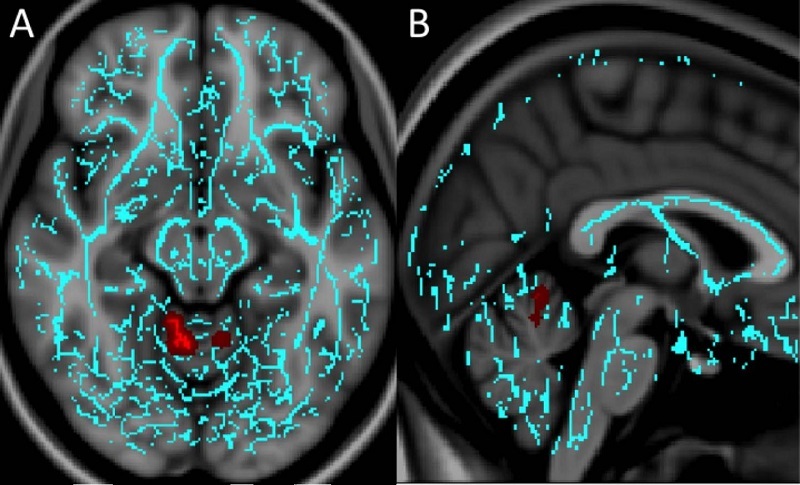 A, Axial and B, sagittal images derived from tract-based spatial statistics (TBSS) results and ren¬dered on T1-weighted MR images from the Montreal Neurological Institute atlas indicate that significant white matter differences in patients with mTBI and anxiety involve the cerebellar vermis, the region responsible for fear conditioning. Voxels with significant differences detected with TBSS were thickened by using the TBSS fill function into local tracts (red) and overlaid on the white matter skeleton (blue). Credit: Radiological Society of North America.